This trip became a thing after I came across a 2-for-1 flight deal. The deal started out of JFK airport in New York flew to Casablanca, Morocco then Lisbon, Portugal. It goes back to Casablanca for a day then back to JFK. The total price for the flight was…$400! Yes $400 for a 2 continent flight. The flight was on a Moroccan based airline called Royal Air Maroc. 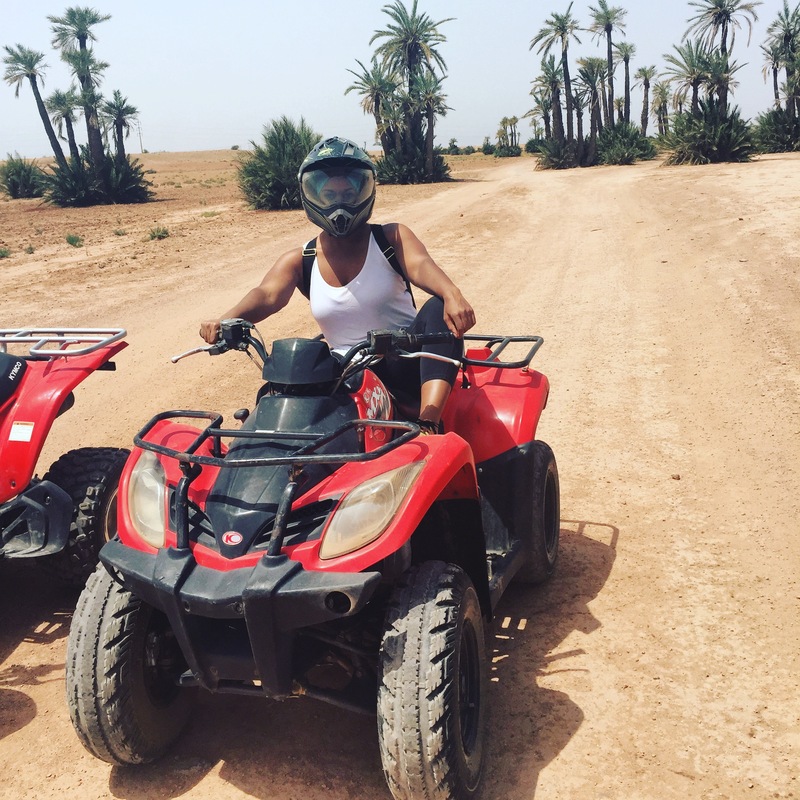 Ok, enough of the boring stuff…here’s what I did while in Marrakech. As I said above, our plane flew into Casablanca airport. The plan was to take a short commuter train at the airport to the main train station in Casablanca then take a longer train into Marrakech. We made it onto the commuter train with no issue. But…we ended up getting onto the wrong train at the main station. We ended going the complete opposite way of where we needed to go! (Insert Jordan crying face) We met a very nice lady on our wrong train who helped to get us on a bus to Marrakech. Had we waited to take the train back we would have literally wasted our whole day. 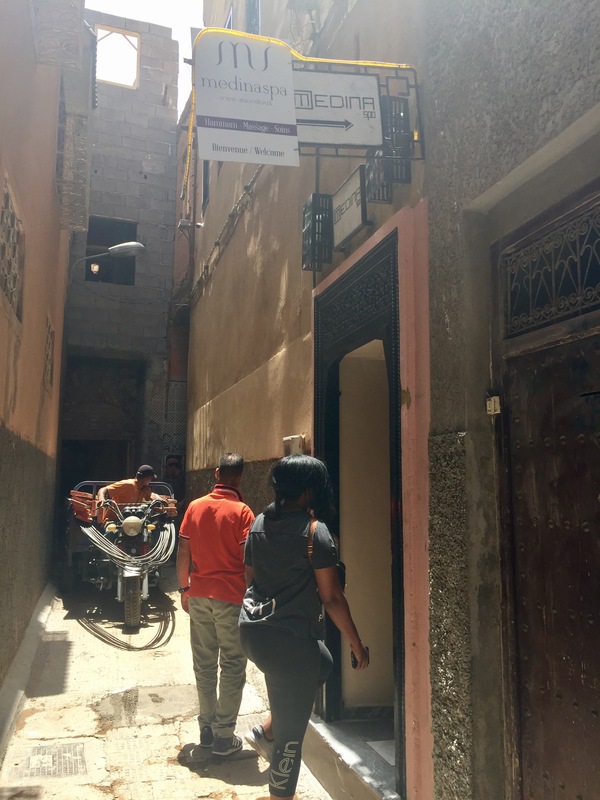 After the 3.25 hour bus ride and an interesting “taxi” ride in a touk touk we finally made it to our beautiful Riad in the heart of the Medina. We were staying at Riad Alnadine. 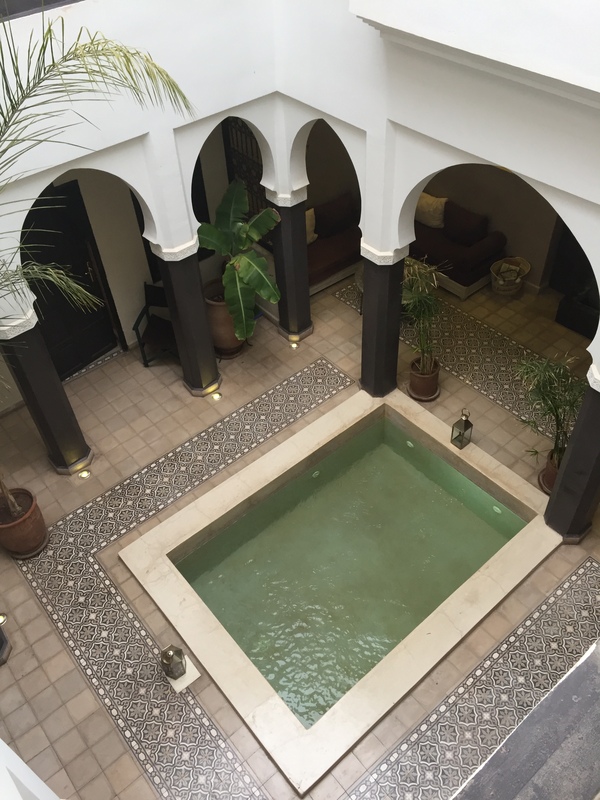 A Riad is a traditional Moroccan bed and breakfast. Our host and the owner, Nadine was from France and was the best! 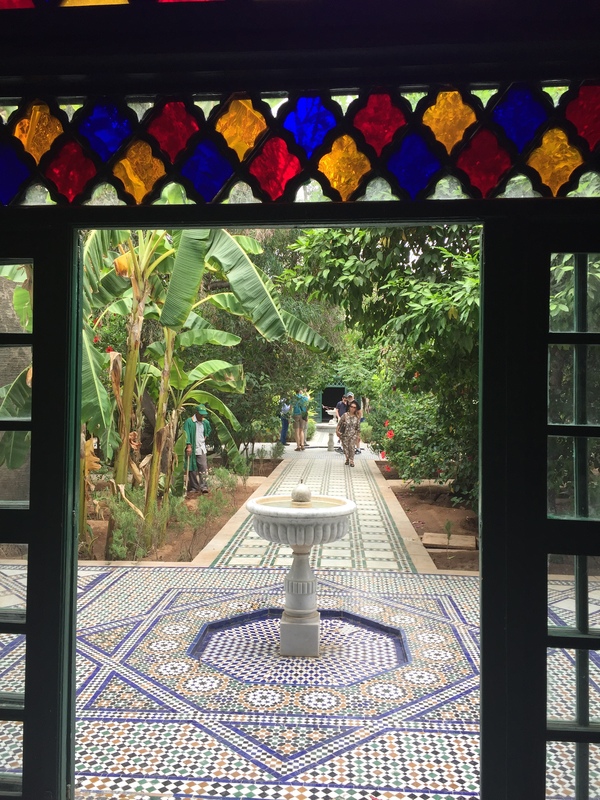 We were given a tour of the Riad and then shown our room. Once we were settled. Nadine walked us to a cute little restaurant just a few steps from the Riad. I ordered the Tajin with tuna. 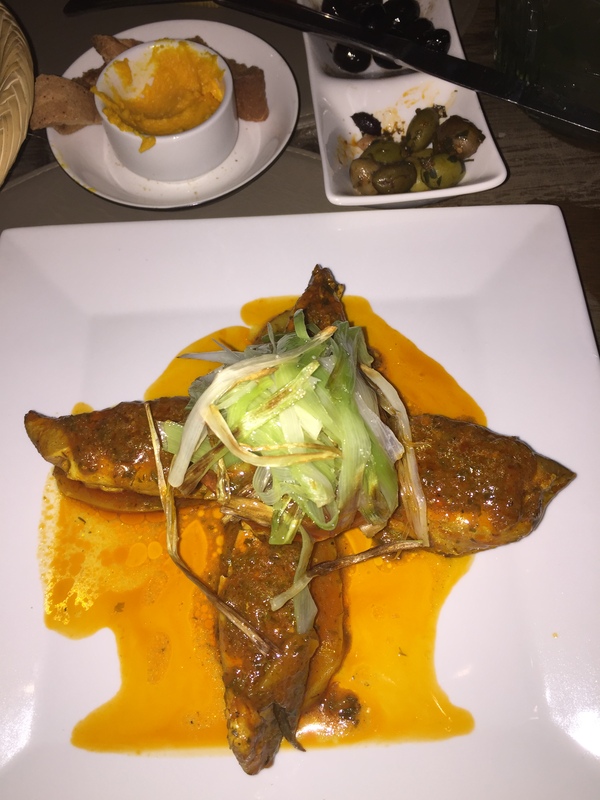 Tajin is a popular blend of Moroccan spices often used on various meats and cooked with vegetables in a clay pot. Most restaurants will also serve bread and marinated olives with each meal. After dinner, we decided to just head back to the Riad to prepare for an adventurous day 2! 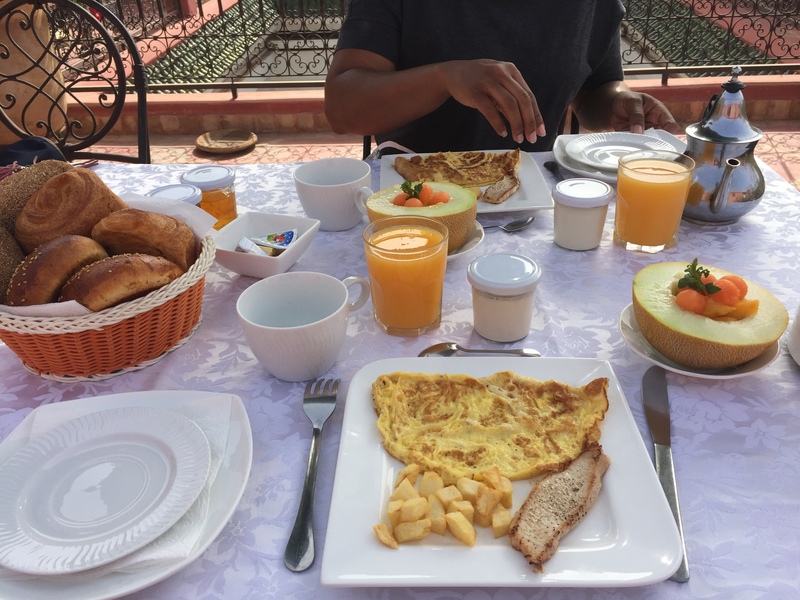 We started our morning with breakfast prepared by Nadine and served on the beautiful terrace of the Riad. We were set to take part in a full day tour beginning at 10am. We booked through a company called Get Your Guide before we went to Morocco. 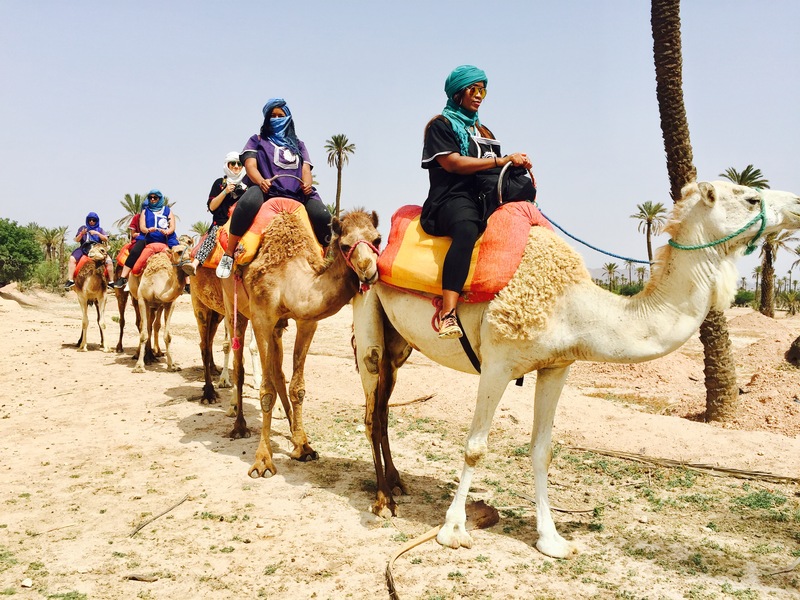 The tour consisted of a camel trek, ATV ride, and finished out with a full treatment at a Hammam. (a Moroccan spa) The price of all of this was only $107 per person. The tour company sent a van to pick us up from our Riad. We made the drive first to the area for the camel trek. When we arrived we were served Moroccan mint tea (the best tea ever and I’m bringing some back) then dressed in a traditional style outfit complete with head wrap. 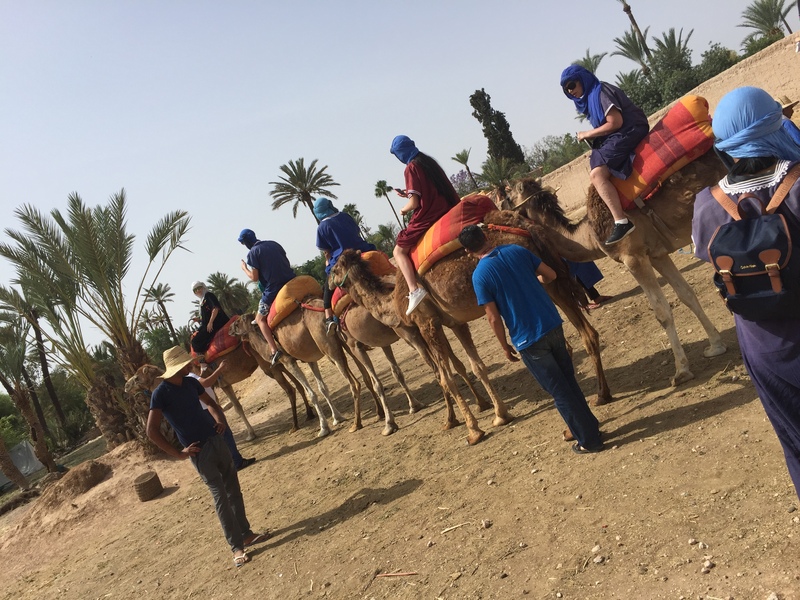 We were assigned to our camels and off we went. The trek lasted an hour (wayyyyy to long if you ask me). We literally just rode the camels through a desert like area. The guide would stop ever so often to take pictures for us. It wasn’t terrible but they definitely can shorten it by half the time in my opinion. Once we arrived, we were given a quick tutorial of the bikes and given our helmets then we were out! The ride last about 45 minutes with a stop in a village for more tea (winning) We rode through dunes and even over some nice hills. It was a blast. We did get pretty dirty though so be prepared for that. We loaded up once again and drove toward Jemma el-Fna (or The Square) where our Hammam would await. We had no idea what to expect before getting to the Hammam. We thought we would simply take a quick shower then receive a watered down version of a massage. Boy were we wrong. We literally received the royal treatment. We were taken to a room where we undressed and were given plush robes and slippers. From there we went into this large sauna room made of ceramic and marble. Overhead was the largest rainforest shower I’ve ever seen. The staff lady told us to rinse off then lay down on the cushioned bench. We were then lathered in some kind of body scrub from head to toe and told to rinse off again. Next we were scrubbed with these exfoliating hand gloves from head to toe and told to lay down for about 5-10 minutes in the sauna heat. We rinsed off yet again before being rubbed down in yet another body cream. We layed down once more before the final rinse down. 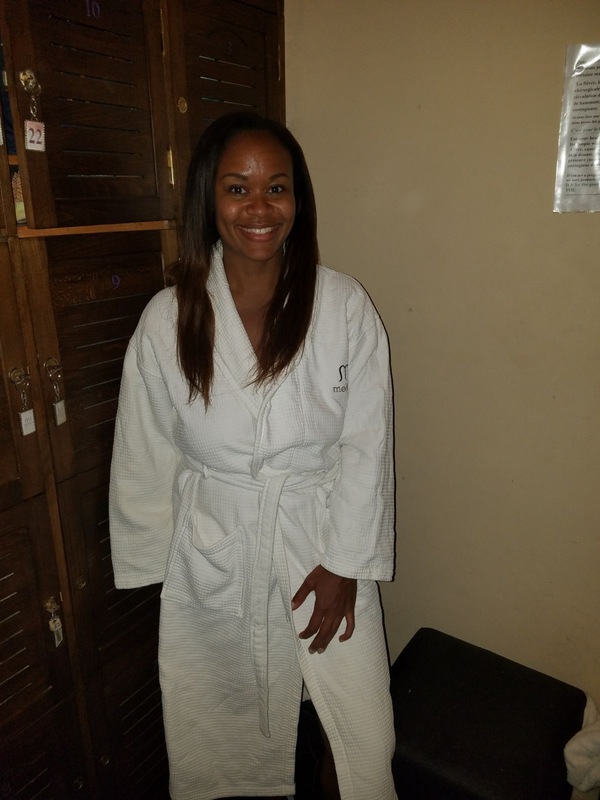 We were robbed and taken upstairs to a massage room where two new ladies greeted us. Next came one of the best Swedish massages I had ever had. The massage lasted about 30-45 minutes and it was heavenly. I literally didn’t want to get up after. We were taken to a cute little sitting area and served more tea. (You literally get tea everywhere.) We changed clothes and met our driver who took us back to the Riad. 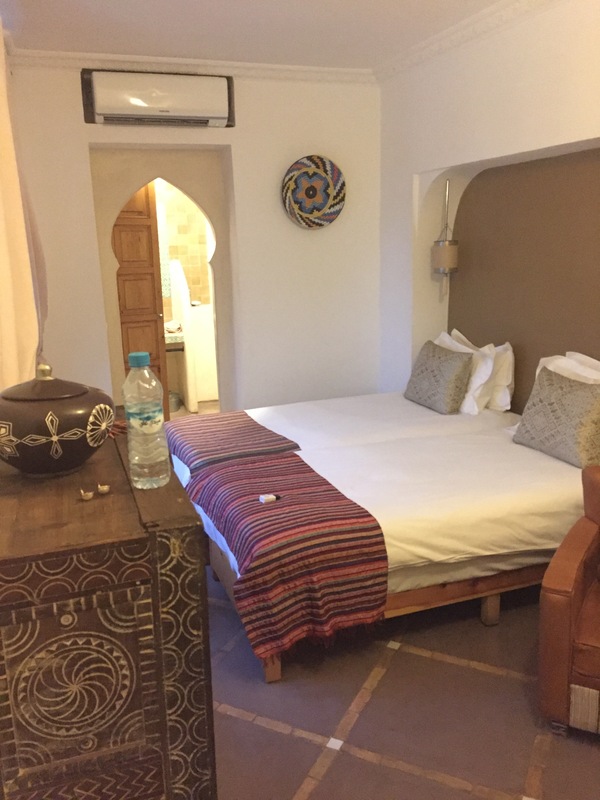 Once back at our Riad, we relaxed for a little before getting dress to head back to the square for an evening of shopping at the souks, eating, and taking in the sights and sounds. 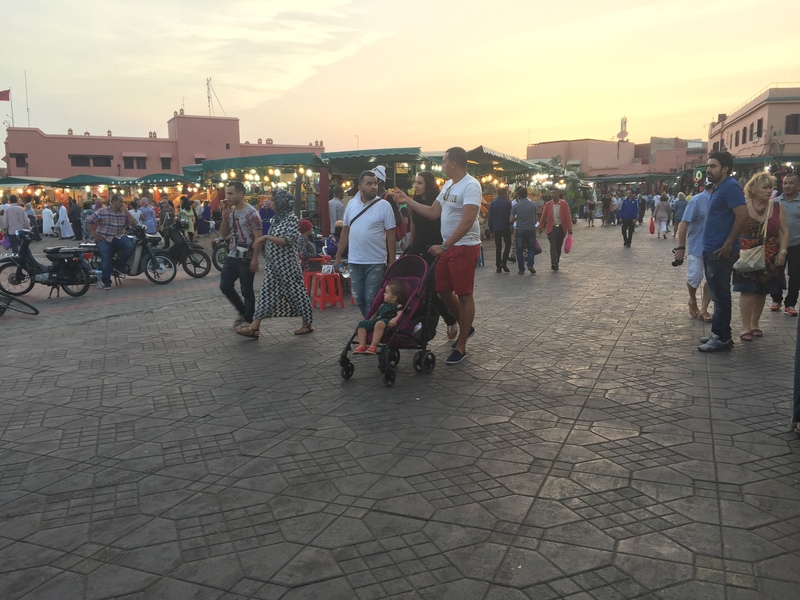 Jemma el-Fna is the main attraction area for traditional Marrakech. It’s a maze of narrow streets filled with souks (Arabic shops) complete with literally anything someone would need. 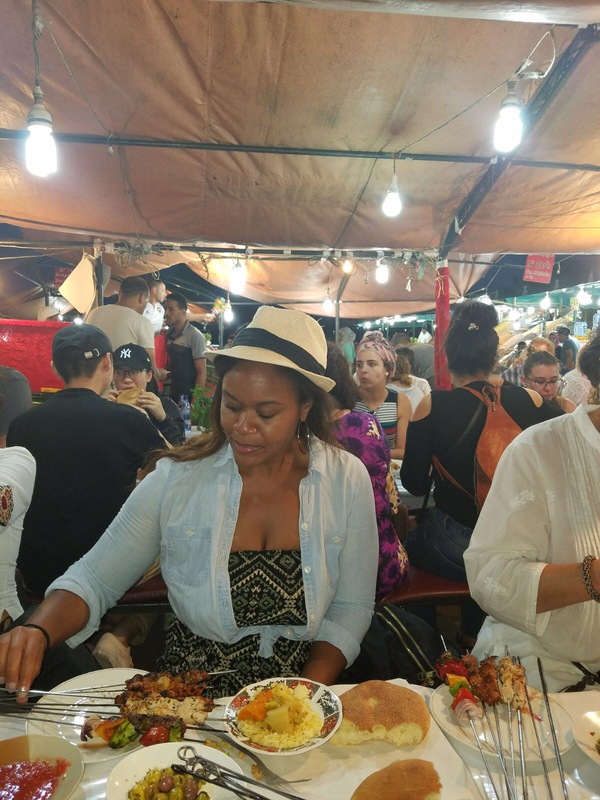 There are lots of restaurants, street food, and fresh squeezed juice stands all around too. A word to the wise, if you ever head to the souks, always bargain when buying things. Never just take the first price they offer. 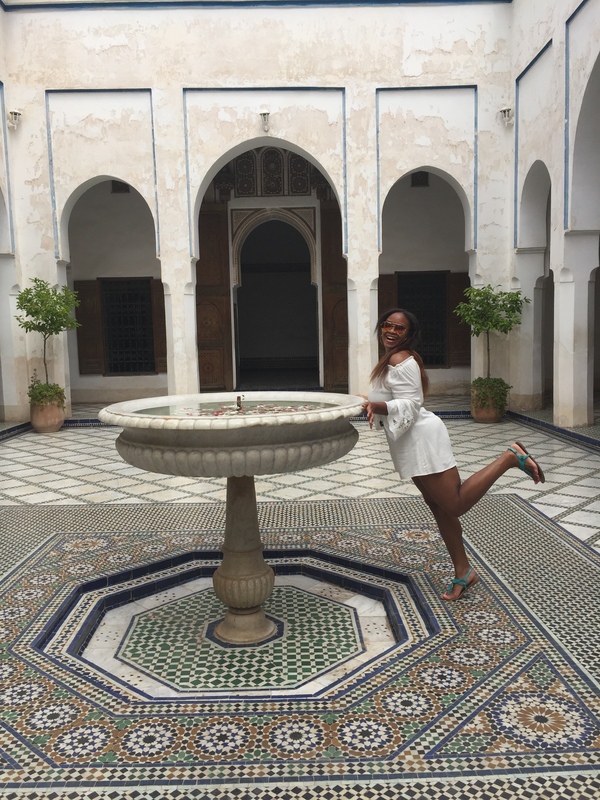 Marrakech can be super cheap if you do it right. That evening, we decided on one of the street food vendors for our dinner. Although it’s street food, you are still seated at a large picnic table to eat. I had mixed meat skewers (lamb, chicken, and kefta) with veggie couscous. After a few hours of taking it all in, it was back to the Riad for the night. 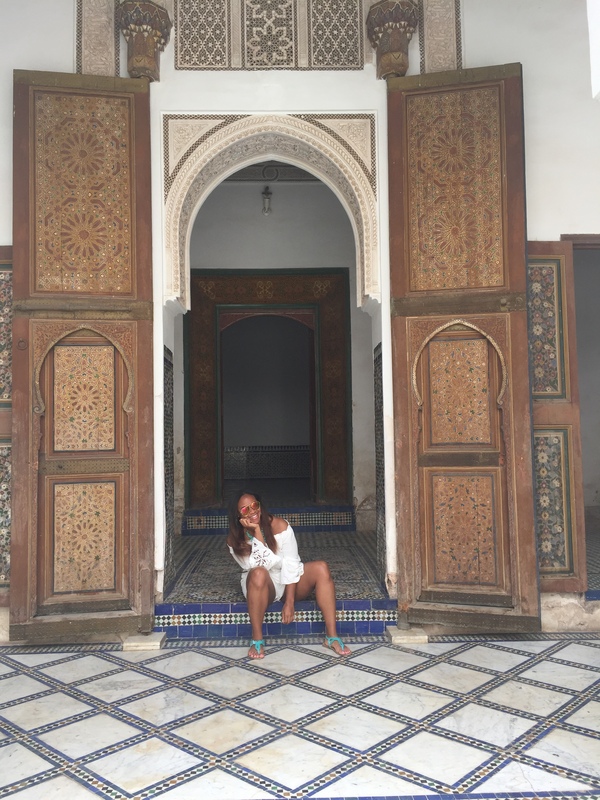 This was our day to see the beautiful palaces and buildings that Marrakech is known for. Luckily, everything was still in walking distance so we didn’t have to pay for transportation. After breakfast on the terrace, our first stop was to Ben Youssef Madrasa. It was 25 MAD to enter. (About $2) Ben Youssef Madrasa was a popular science university and mosque back in the day. The building which still stands is very detailed with clay and brightly colored hand painted tile. It was beautiful. I literally had an entire photo shoot here. 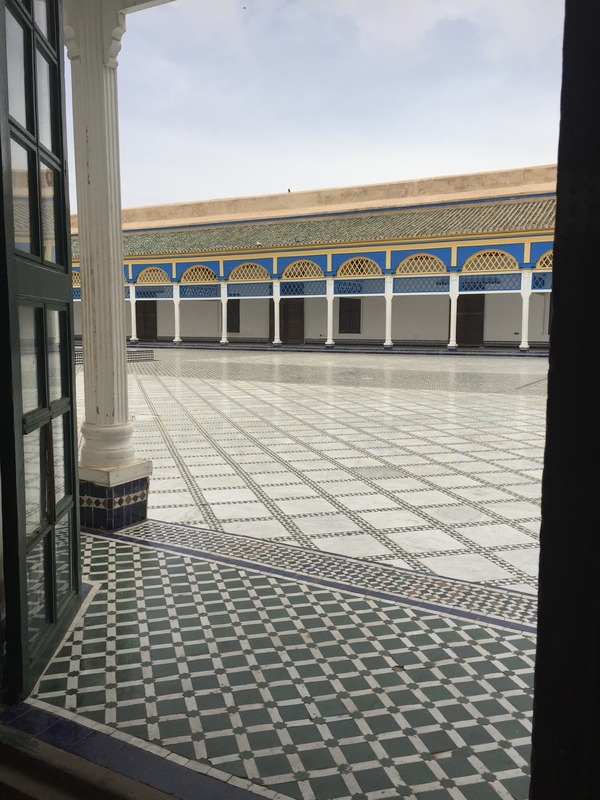 Similar to Ben Youssef, the colors and details at Bahia palace were amazing. And yes…another photo shoot took place. 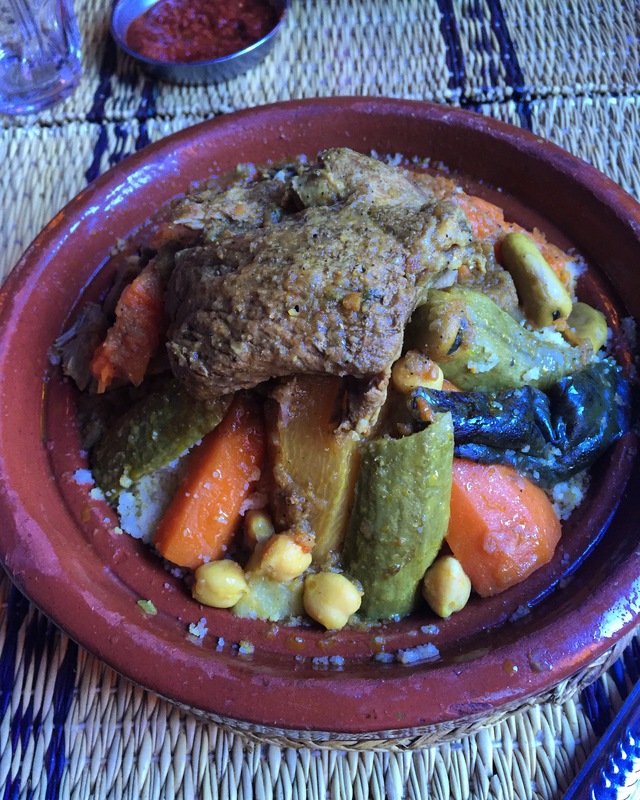 We trekked our way back toward the square and found a cute little restaurant called Chez Brahim. I ordered the lamb couscous meal which started with a Moroccan salad and ended with fresh oranges sprinkled with cinnamon. It was delicious. For our last few hours we walked around the square just taking it all in for one last time. 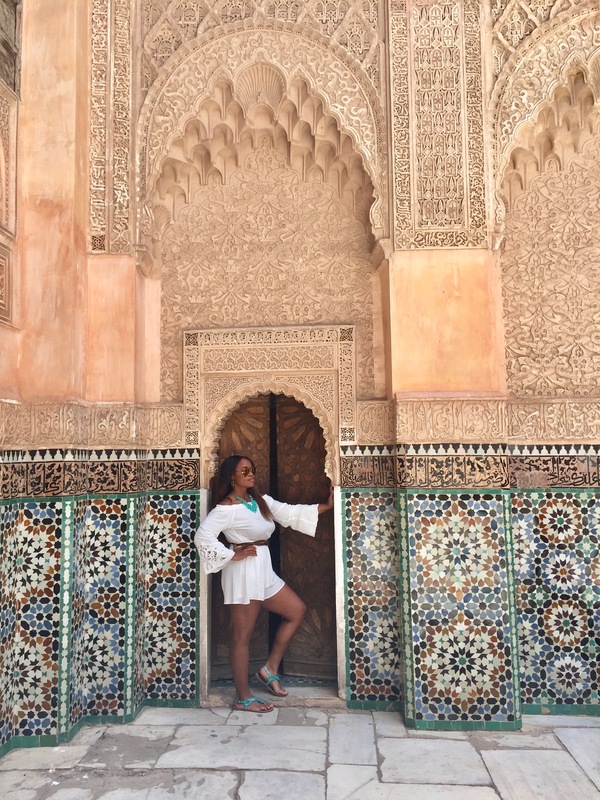 Marrakech gave me exactly what I needed from it. Old clay buildings coupled with detailed carvings and colors. You won’t need more than 4 days or so to see everything it has to offer.